With Kore's technology, the cost of ownership is very low, compared to what you get out of it, and compared to other products on the market. Looking for the best way to Unleash Your Eclipse Data? Kourier Integrator with SQL Accelerator will unleash your Eclipse data and put you on the fast track to better Eclipse reporting and business intelligence. 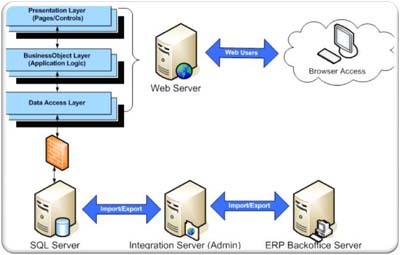 Kourier Integrator is the easiest, most flexible, and reliable technology for integrating your Eclipse data with Microsoft SQL Server. Everything you need to quickly define and manage a SQL Server data warehouse is included, starting with a pre-configured Operational Data Store (ODS). Kore's ODS for Eclipse has pre-defined mappings for many commonly used Eclipse files, including the important and complex LEDGER file! And by using Kore's Net Change Technology, your data warehouse is updated in near real-time, enabling you to create time sensitive reports and dashboards for your business critical data. Many leading Eclipse distribution companies have already chosen Kourier Integrator and Kore's ODS for their reporting and business intelligence system. What are you waiting for? Kourier Integrator essentially mapped out about 90% of the data for us with the predefined Operational Data Store. That was a huge benefit for us. ODS includes data from the LEDGER file! Why use an ODS? Because you will have faster, easier access to your Eclipse data when it's in a normalized Microsoft SQL Server data base. You will also have far more choices for your reporting and business intelligence software too, including: Rocket Software CorVu, IBM Cognos, Microsoft Excel, Microsoft Reporting Services, and SAP Crystal Reports. Kore's pre-defined Operational Data Store (ODS) for Eclipse provides the fastest and easiest way to get started with data warehousing for your Eclipse system. Included in the Eclipse ODS are pre-configured data mappings for 27 key Eclipse files representing about 85 normalized SQL tables, including the complex LEDGER file, which is a very important source of information. The ODS can be used as the basis for developing custom reports and dashboards or as the foundation for an enterprise business intelligence system. The Eclipse ODS is ready to use and includes everything you need to create and maintain a Microsoft SQL Server data warehouse, and it's customizable and extensible to meet your needs. Your Eclipse ODS is always up-to-date because Kore's "Net Change" technology constantly monitors the Eclipse database for any changes, and then performs optimized, near real-time updates to the SQL database using Microsoft SSIS technology. See the Kourier Integrator product home page for more information.